Your home’s appearance from the street can make the difference between a drive by or an offer. Here are some suggestions on how to maximize your investment and boost your curb appeal. As a home seller, one of the top questions on your mind often is “How can I get the most money for my property?” One of the best and often easiest ways to do this is by improving your home’s curb appeal. The front of your home is the first impression that a potential buyer gets, and has the ability to either create positive intrigue and draw the buyer in, scare them away from looking inside altogether, or negatively color the rest of the home if they do look. On this page, you’ll find some of our top ways to improve your home’s curb appeal. With a little investment of time and resources, you can make your home stand out from the crowd and bring more buyers through your door. Your front door is the gateway to your home. A new front door instantly enhances your home’s appearance, especially if your current door is dated looking or showing signs of wear. 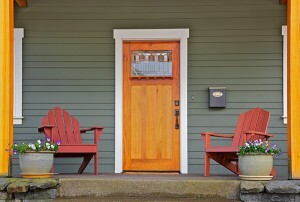 Having an attractive front door can make a potential buyer feel more desire to make your home theirs. In the “2015 Remodeling Impact Report” conducted by the National Association of REALTORS®, it was found that upgrading the front door of a house typically costs $2,000, with a median recoupment of $1,500, or 75%. This percentage is relatively high for home improvement projects, and, when combined with the potential psychological effect on a buyer, makes front door replacement a strong option. An exterior facelift (new paint, siding, or trim details) automatically transforms the look of a home. Periodic maintenance of that exterior surface is the surest way to keep your house and it curb appeal looking its best. Any obvious defects, such as cracked or rotting material, can downgrade the aesthetic and quickly turn away potential homebuyers. Once defects are repaired, look for ways to add personality with color, trim, or shingles. 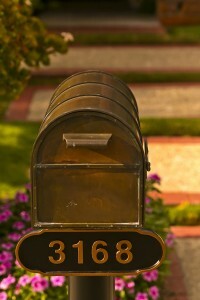 House numbers, the entry door lockset, a wall-mounted mailbox, and an overhead light fixture are all elements that can add style and interest to your home’s exterior curb appeal. If they’re out of date or dingy, your home may not be conveying the aesthetic you think it is. These elements add the most appeal when they function collectively, rather than as mix-and-match pieces. Oiled-bronze finishes suit traditional homes, while brushed nickel suits more contemporary ones. Pull those weeds and put down fresh mulch. These are two simple improvements that can drastically improve curb appeal. Along with adding some flowers or trimming the bushes, all this can lead to buyer’s falling in love with your home even more. 5. Let the Sunlight In! One of the simplest but most satisfying fixups you can do is to make your windows sparkle and shine, letting in clear summer light. Also, pull back the drapes and curtains to brighten up rooms. 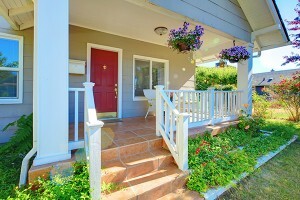 Porch and stoop railings can deteriorate quickly if not treated properly. If your railings are past their prime, look for quality wood or metal components to replace the existing material and improve curb appeal. As with other improvements attached directly to the house, make sure the color, scale, design, details, and material are compatible with the home’s main features. Another way to add curb appeal is to make sure your lawn is green, says Jason Jacques, president of Exit Mountain Realty (NC). Fertilize your lawn in early and late spring and early and late fall. Also, make sure it gets enough water. Another little-known secret to a greener lawn is to cut the grass longer. Set your mower deck to the highest level. You might have to mow the lawn more often for a while, but when your house is for sale, you want buyers to fall in love when they drive by for the first time. Even if it’s green, however, a lawn full of weeds will look like a maintenance nightmare to home buyers. In the spring, use a pre-emergent herbicide to prevent weeds from growing. If your lawn is a lost cause, consider hiring a landscaper to tear it out and lay new sod. Create a permanent welcome mat by tiling or painting a design that contrasts with the porch floor or front stoop. Not only will you not have to worry about replacing the mat when it gets ratty, but you can impress your visitors with your creativity. 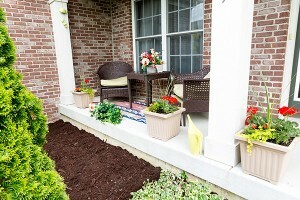 Container gardens add a welcoming feel and colorful curb appeal to any home exterior — quickly and affordably. You can buy ready-made containers from garden centers or create your own with your favorite plants. For most landscapes, a staggered, asymmetrical arrangement works best to create a dynamic setting.